Blaine Kennobie, 79, of Kennebec, died Saturday, Sept. 8 at Rapid City Regional Hospital. Services were held at 2 pm, Friday, Sept. 14 at American Lutheran Church in Kennebec with burial at Kennebec Cemetery. When Blaine was almost a year old his family moved to South Dakota. He started school in a country school house north of Presho. They lived on what was called the Reed Ranch. This is where Blaine developed his love for the South Dakota prairies, which would stay dear to his heart forever. At the age of 10 his family moved back to Webb, IA where he continued his schooling. Pete loved the outdoors. He enjoyed horseback riding, hunting, ice skating, sledding and skiing. During his school years he was active in church activities, baseball, basketball and FFA. Later the Kenobbie family bought a farm SE of Greenville, IA. At this time he attended the Greenville-Rossie High School. This is where he met the prettiest girl in school, Beverly Carol Bryan, the love of his life. Blaine and Beverly graduated together in the Class of 1957 as High School Sweethearts. On June 28, 1959 Blaine and Beverly were united in marriage at the Congregational Church in Sioux Rapids, IA. They were blessed with four children: Randy, Carol, Roger and Roy. While farming and raising livestock, Blaine and Bev lived in Greenville, Gillett Grove, and Webb. In July of 1969 they settled on a farm NW of Laurens, IA. Here they spent the next 17 years raising their family, farming, milking cows and raising livestock. You could say they had an Old McDonalds Farm with almost every animal you can think of. Blaine’s roots kept calling him back to South Dakota. In the spring of 1986 they made the big move west taking everything – machinery and cattle included. For the next nine years they lived in various places raising cattle. Blaine also worked part time during the winter months at the Chamberlain John Deere, working on equipment. In 1996 Blaine got his boyhood dream of owning his own land in Lyman County, SD where all you see is prairie and sky. This is where they’ve made their home ever since. 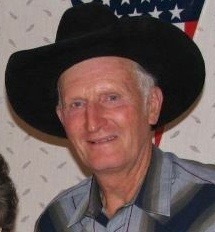 Through the years Blaine has enjoyed playing basketball in high school, square dancing, playing cards, pheasant hunting, riding horses and playing his guitar and singing to his sweetheart Bev. Another favorite pastime was collecting and restoring many old two-cylinder John Deere tractors and implements. In later years Pete really enjoyed South Dakota history and reminiscing of the cowboy days and life on the range. So his dream of becoming a “West River Cowboy” really did come true. He was truly at home riding the prairies of South Dakota. Grateful for having shared his life are his wife of 59 years, Beverly; son Randy (Deb) Kenobbie of Laurens, IA; daughter Carol (Scott) Banks of Spencer, IA; son Roger Kenobbie of Kimble, SD; son Roy (Marcia) Kenobbie of Hot Springs, SD; 13 grandchildren; 10 great-grandchildren; two sisters: Joyce (Stan) Garton of Odenville, AL, Carolyn Beasley of Centralia, MO; two brothers Dan Kenobbie of Newnan, GA and Lyle (Linda) Kenobbie of Greenville, IA, and many nieces, nephews, relatives and friends. Blaine was preceded in death by his parents Bernerd and Tressie; his in-laws Wesley and Margaret Bryan; sister Betty Lou Kenobbie; daughter-in-law Tammy Kenobbie; two sisters-in-law: Karen Kenobbie and Judy Kenobbie; two brothers-in-law: Don Bryan and Ray Beasley; niece Valerie Wilson and grandson-in-law Cole Buchholz.